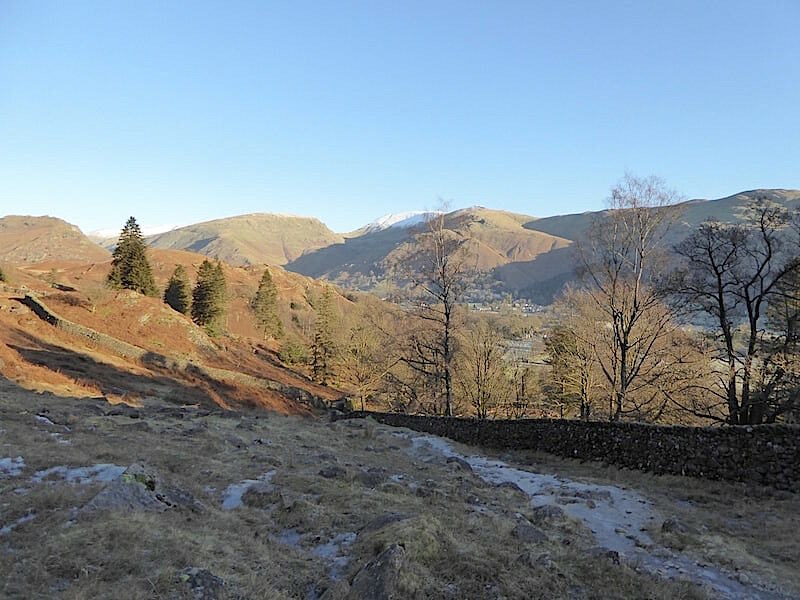 True to the forecast the day dawned even brighter and sunnier than it did yesterday so after a couple more painkillers, and another hot water bottle stuffed behind my back, off we went down to Grasmere for a walk up Silver How. Once we were up there we’d decided we’d assess the back pain situation and simply take things from there. 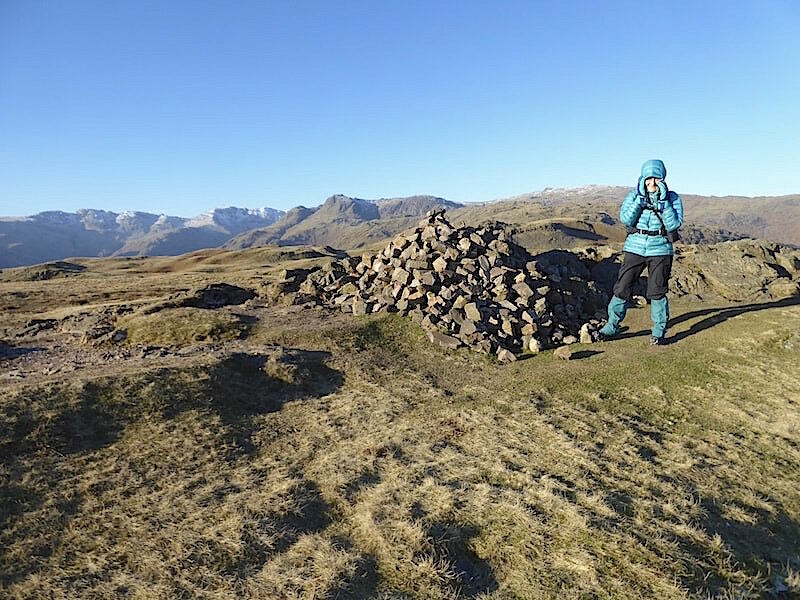 It was much colder today than yesterday thanks to the very strong and incredibly cold wind so we took a bit of a buffeting. The sunshine was nice to have but it was no match for the wind and little warmth was to be had from it. 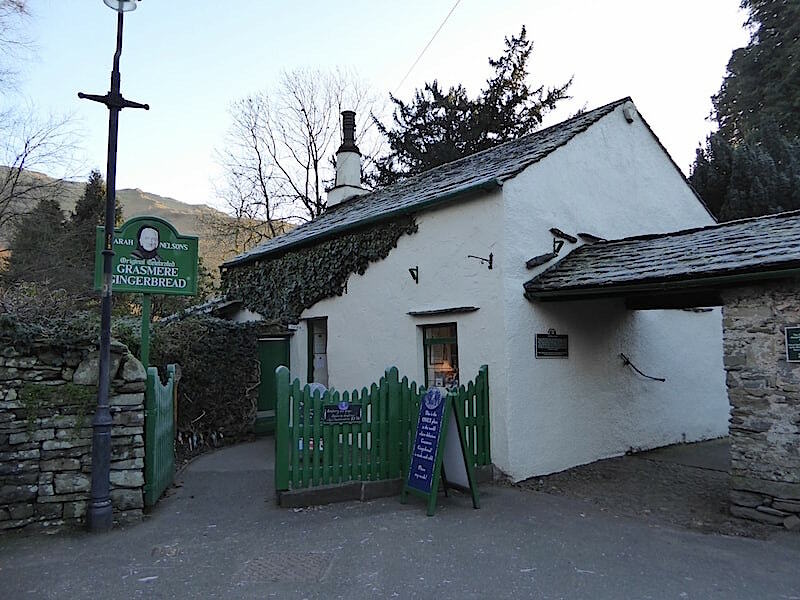 The riverside walk from the lay-by brings us out beside the Gingerbread Shop in Grasmere where the sound of doors and gates being opened indicated that the shop was gearing up for another day’s business. Its 9.40 am and its a very chilly morning indeed. 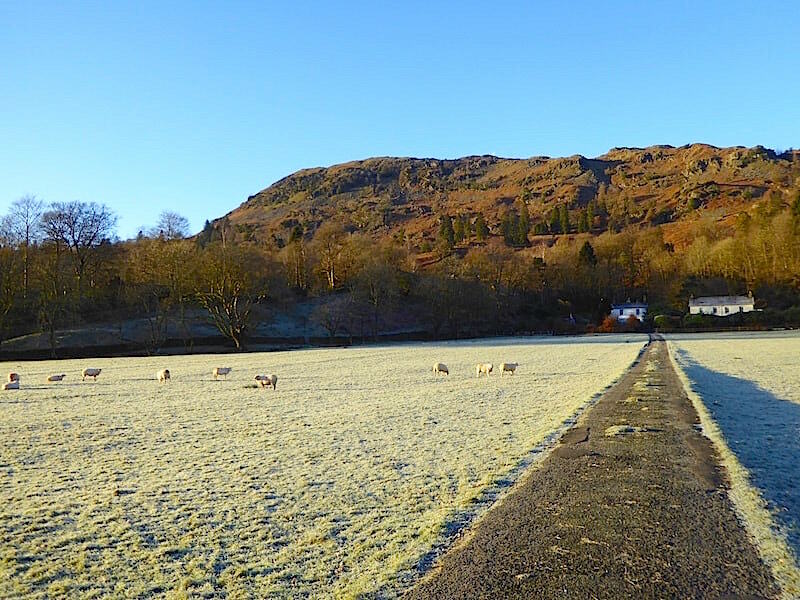 It was four degrees below freezing when we left home and by the time we reached Grasmere the temperature had crawled up to minus two. The sun is not yet high enough so much of the village was in the shade and the cold wind whirling around was only adding to the freezing conditions. 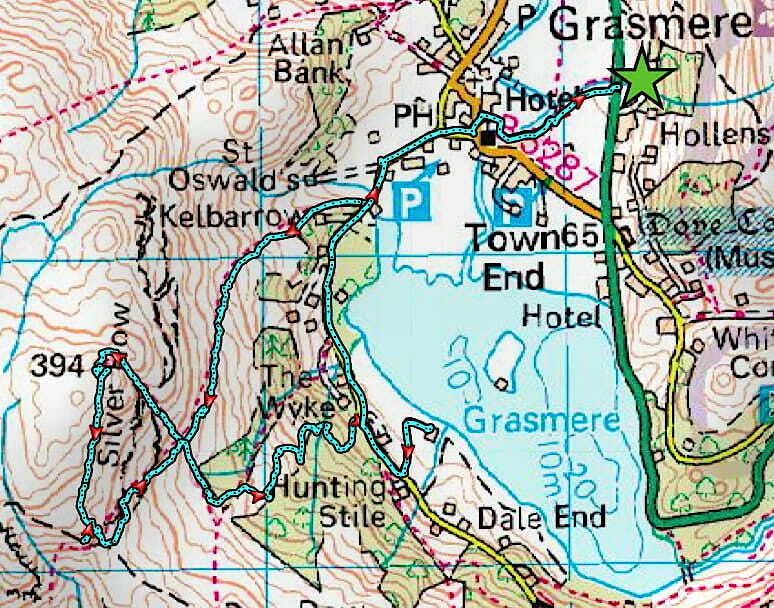 We follow the road round to St Oswald’s church and then take a right turn along the road directly opposite it. 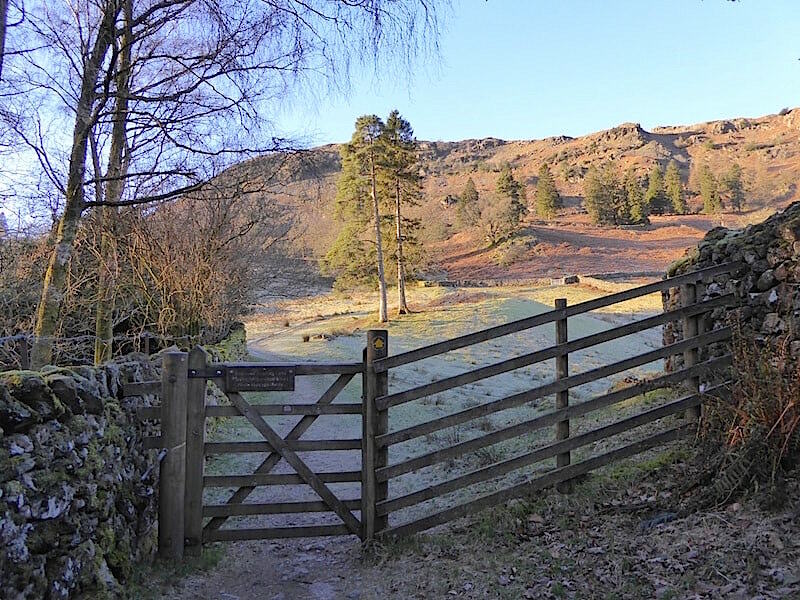 The road leads towards the head of Grasmere water and offers a clear view of Allan Bank, a Grade II listed Georgian house which was once the home of William Wordsworth and his family. William and his wife Mary are buried in St Oswald’s churchyard. As you can see we are still in deep shade and the fields are heavy with overnight frost. 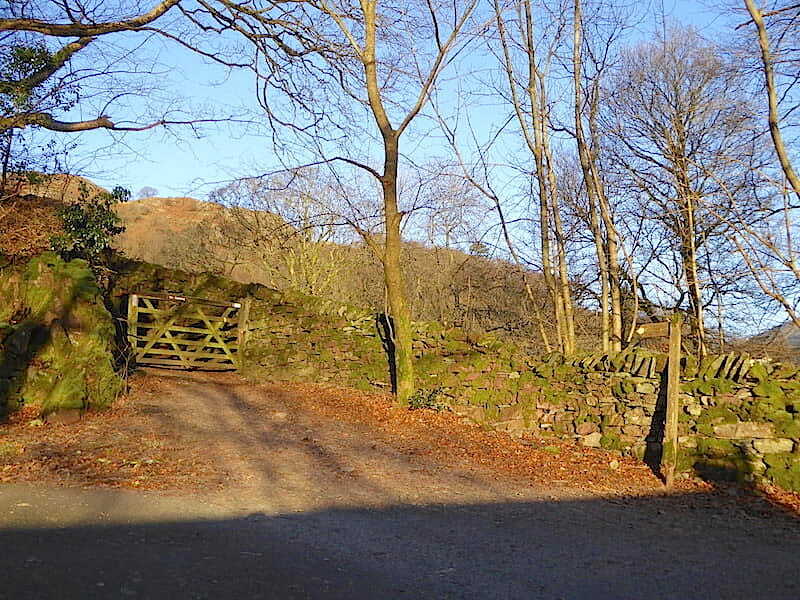 A view of Silver How from the driveway to Wray Cottage. We’ve rounded a bend in the road behind me and are now in the full glare of the sun so we can’t see a thing as we walk along. The grass in the fields has crisped up into stubby green icicles but the sheep seems to be tucking in regardless. Right now I could do with a cup of hot cocoa and despite the thick insulated gloves my finger ends are numb. At this point we turn off the road and go through the gate to take the path up to Silver How. Just off to the left of the shot is a private driveway flanked by two squat and sturdy gateposts bearing the name Kellbarrow, and behind me a banner, attached to a long, green and somewhat dilapidated looking shed, proudly proclaims that this is ‘The World Famous Faeryland Grasmere.’ I can never quite work out what faeries have to do with it though, its simply a cafe situated beside the water, they also have “Romantic Rowing Boats’ for hire. Perhaps I just don’t have the necessary romantic disposition to see it any other way. Anyhow, be that as it may, we go through the gate and walk up the walled track. 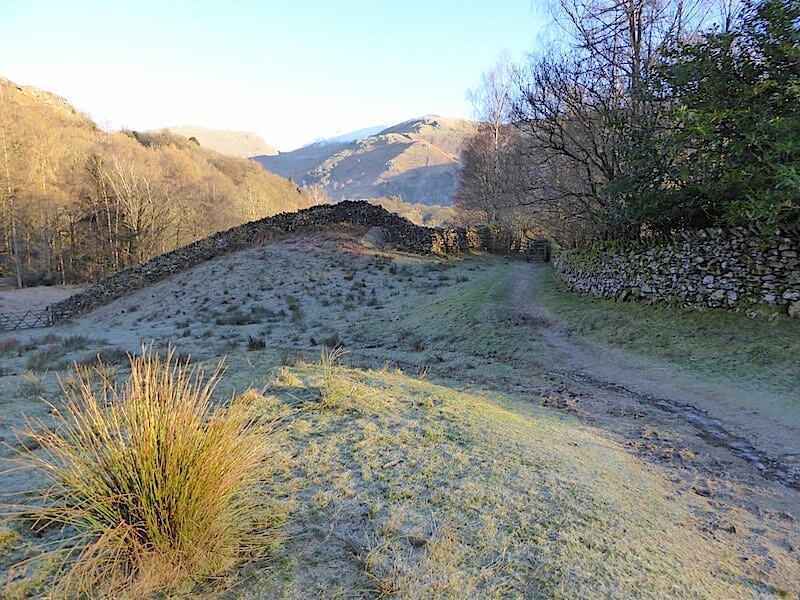 The afore-mentioned walled track where it was decidedly nippy and definitely as chilly as it looks in the shot. Once through the handgate there’s just a little more walking in the shade to be done before we get the benefit of the sunshine on the open fell. 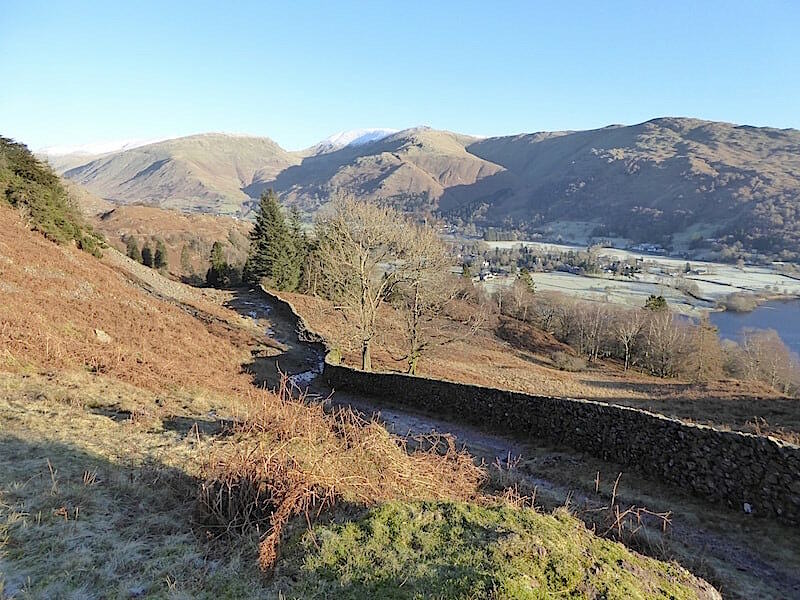 A look back at Stone Arthur rising beyond the wall as we reach the open fellside and savour the sunshine. Its not warm by any stretch of the imagination but its a whole lot better than it was walking up the lane. 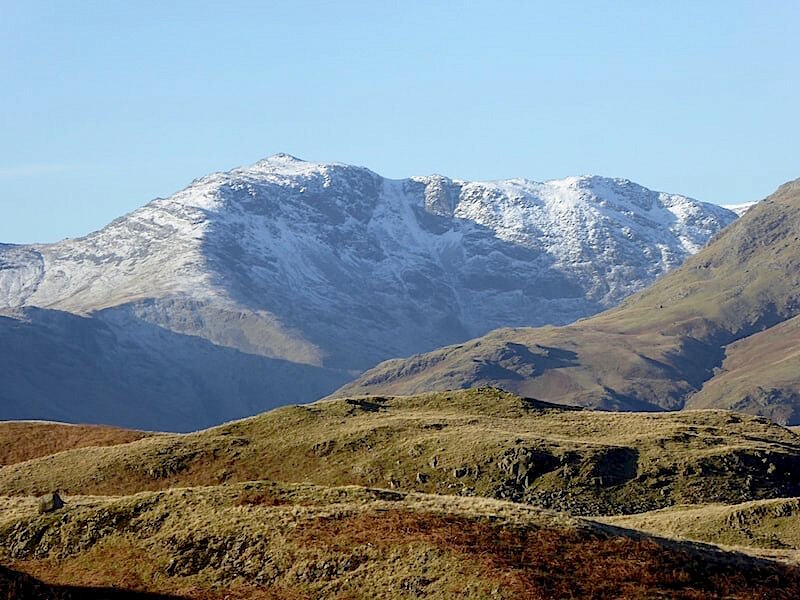 A much clearer shot of Stone Arthur with a snow covered Fairfield behind it, and on the left above the trees is Seat Sandal. We decided to put the microspikes on at this point as the track had morphed into a ribbon of solid ice. The ice-bound track runs alongside the wall but the sun will not get high enough today to melt the ice. It is, however, high enough for it now to be directly in our eyes and making it difficult to see where we are going or take any shots of the views ahead of us. 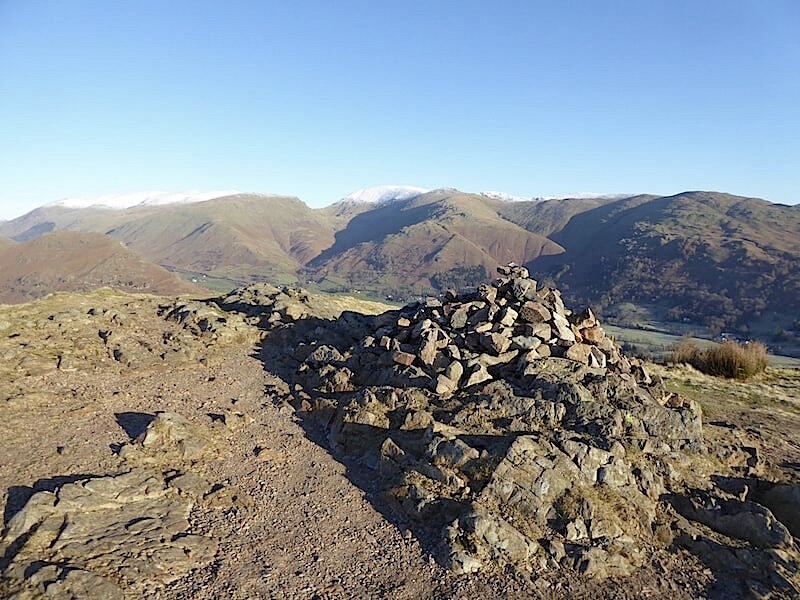 Determined to have a view of something other than what lay behind us I climbed atop this little knoll which provided a lovely little view of Grasmere, with Rydal Water beyond it, and both of them being watched over by Nab Scar. 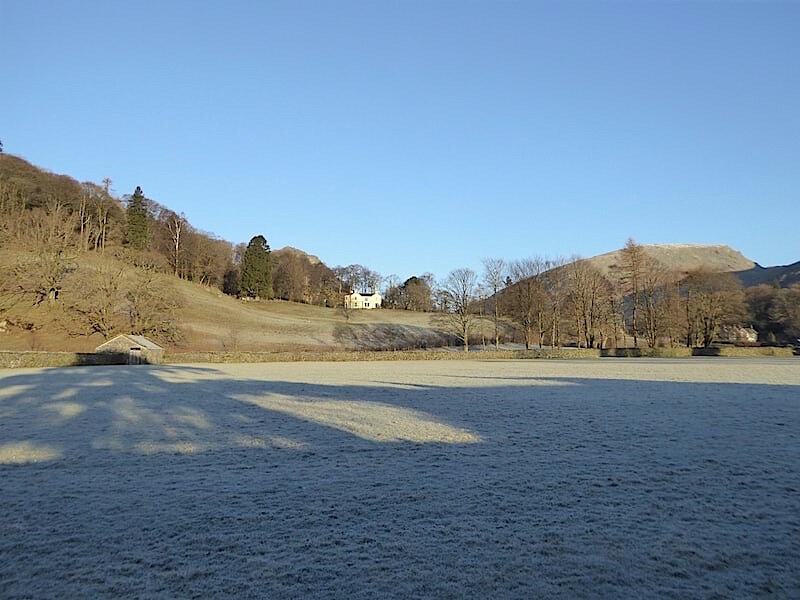 The sun is making no impression on the frosty fields alongside the water. Another look back towards the village from the same little knoll. 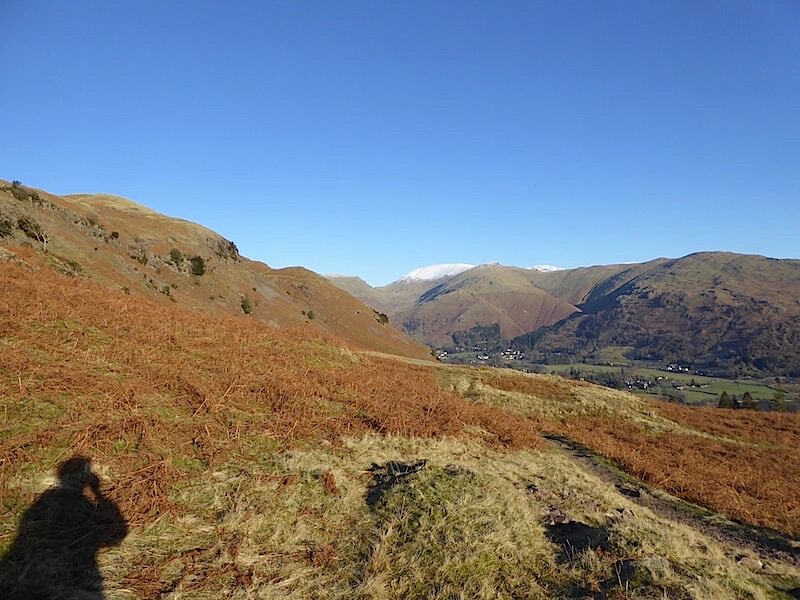 So far we haven’t seen anyone else, not even a dog walker, and we continue along the deserted path until we reach …..
….. a junction in the path where we take a right turn up this path and head for Silver How summit. 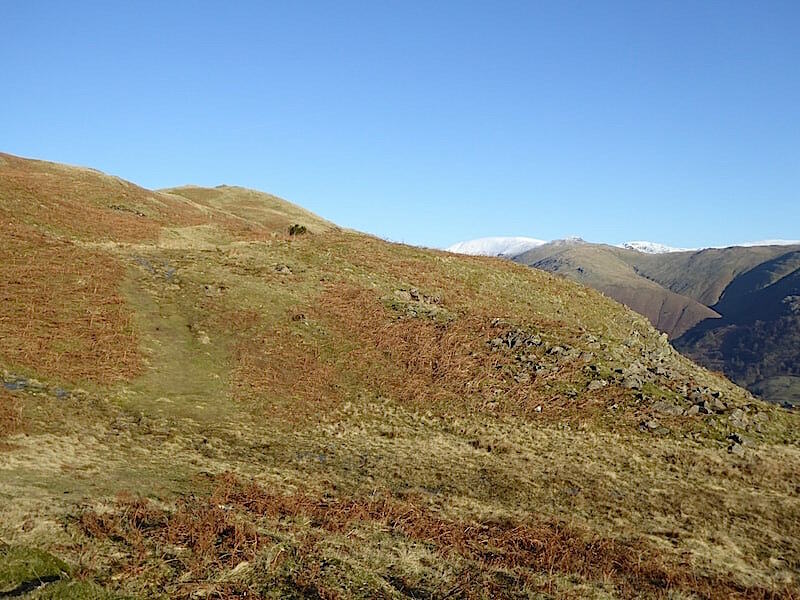 An alternative route to the summit would be to stay on the original path, which goes off to the left, and simply follow it round until you reach the summit cairn. 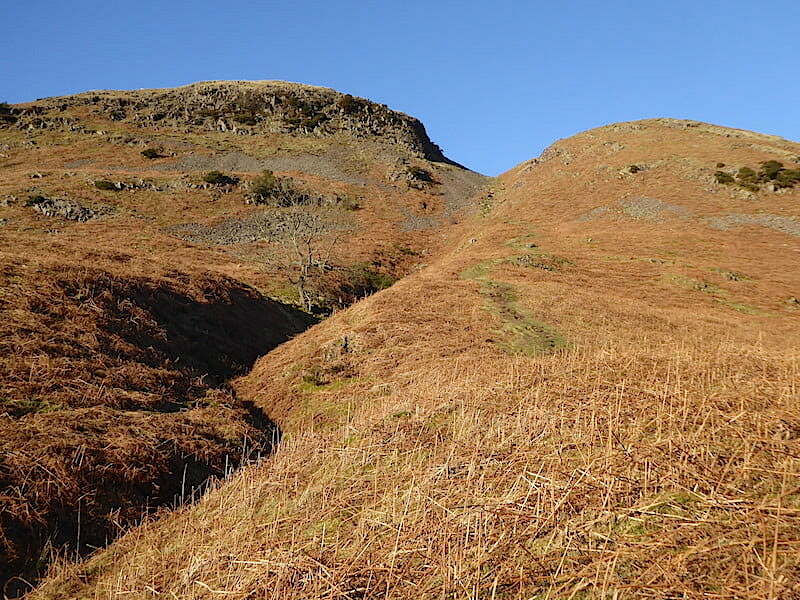 Going up here will be a shorter but steeper route. The path is grassy to begin with but a pitched stone path makes life a little easier where the climb starts to become much steeper. 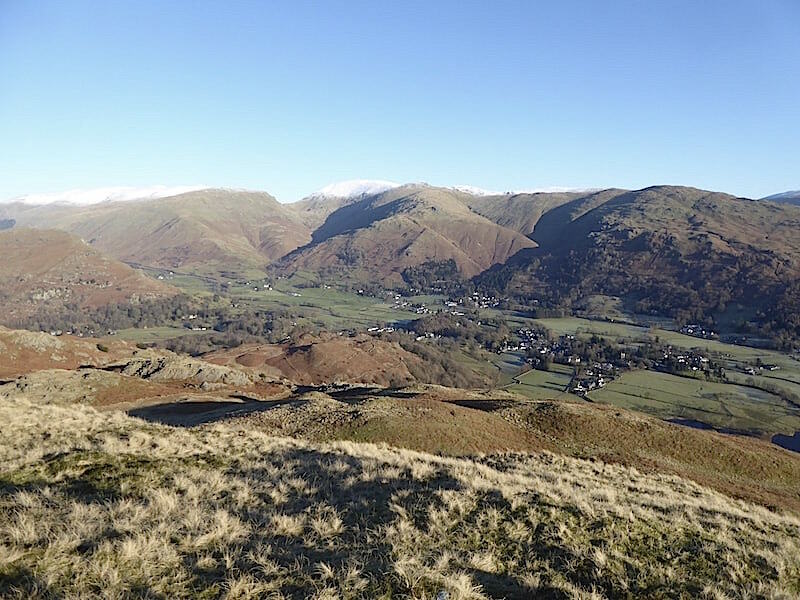 If you are young and fit its not too difficult a climb, being neither I needed a couple or three pit stops along the way and my niggling back pain is becoming a nuisance. 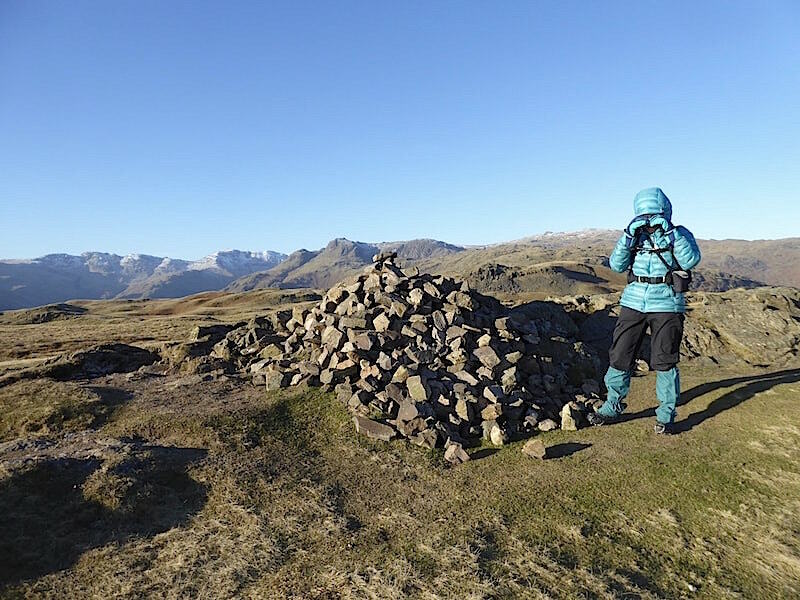 We reached the summit where we decided to huddle out of the strong wind behind one of Silver How’s many humps and bumps and have a Mars Bar and coffee break whilst taking in the panorama of fells on display to the west of us. 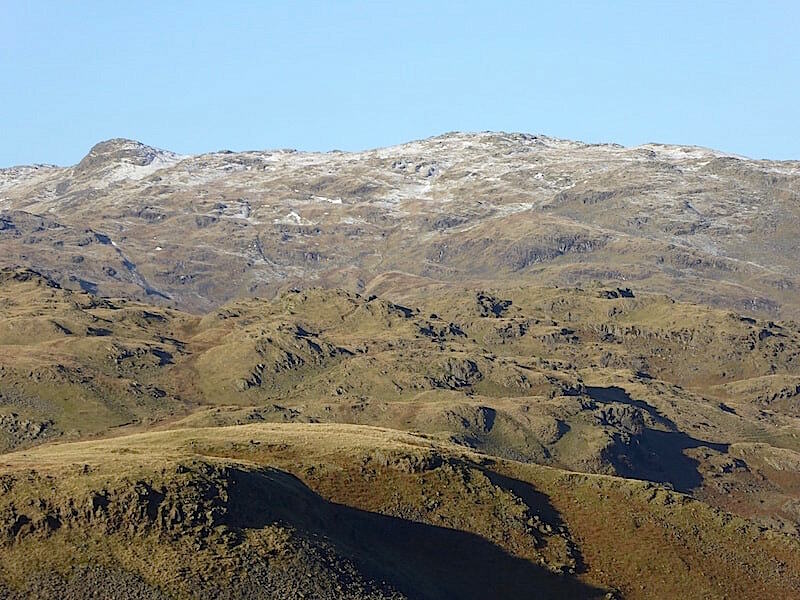 While we were there I took a few close up shots of what we could see …..
….. way over to the south west Lingmoor Fell is the darker area across the middle foreground and beyond it is Wetherlam and some of the Coniston fells …..
….. a little to the right of them is Pike O’Blisco with the north western end of Lingmoor Fell below it …..
….. to the right again and there’s the higgledy piggledy cluster of Crinkle Crags and their next door neighbour …..
….. the mighty Bowfell …..
….. and to the right of Bowfell the spectacular Langdale Pikes. The absence of cloud and the very bright sunlight bouncing off them giving us the clearest view of them that we’ve had for long time. 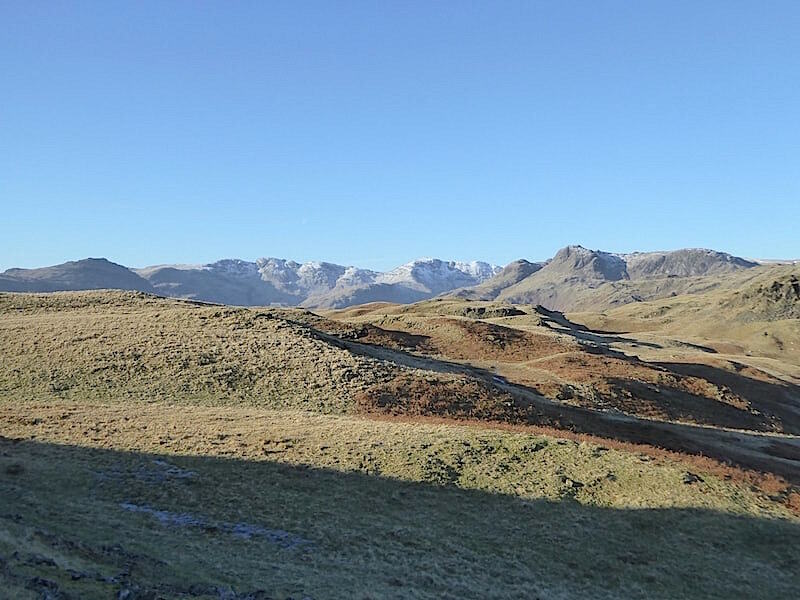 To the right of the Pikes is Sergeant Man, the rocky mound on the left, and way over to the right is High Raise. 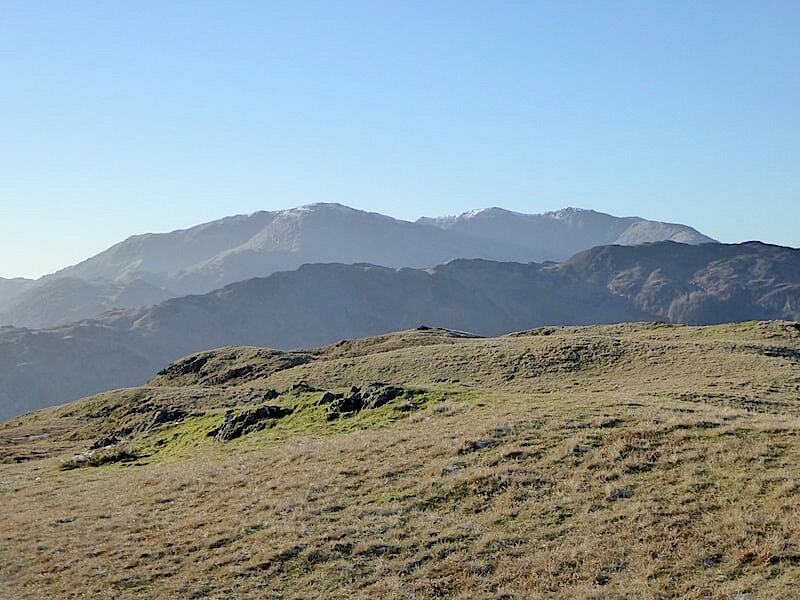 The views to the east are just as impressive with the Helvellyn range over to the left. 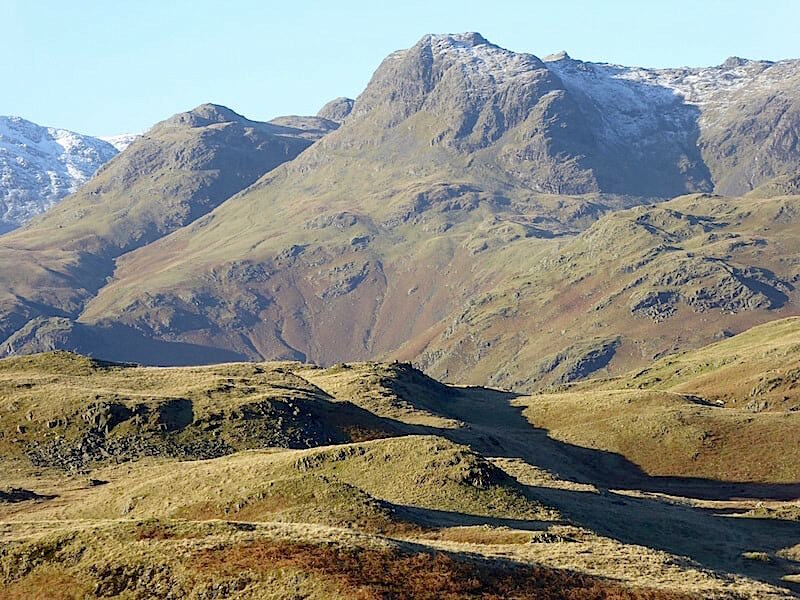 The U shaped gap in the centre is Grisedale Hause from which rises a snow free Seat Sandal on the left of it and a very snowy Fairfield to the right. 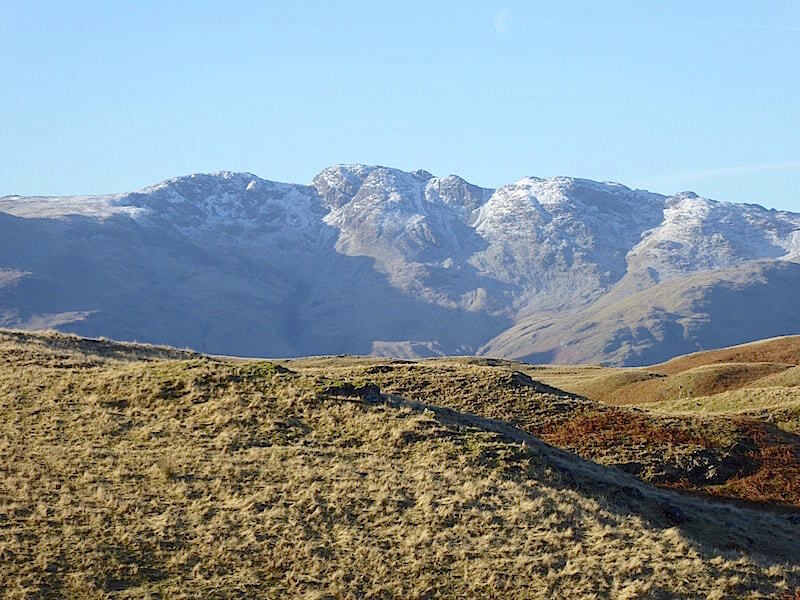 Below Fairfield are Great Rigg and Stone Arthur. All in all you get a fair amount of reward for not a great deal of effort. Silver How deserves something better by way of a summit marker but it has to make do with this heap of stones piled into an unremarkable jumble. The sunlight seems to be much brighter than it was yesterday and the wind is much, much stronger and bitingly cold. 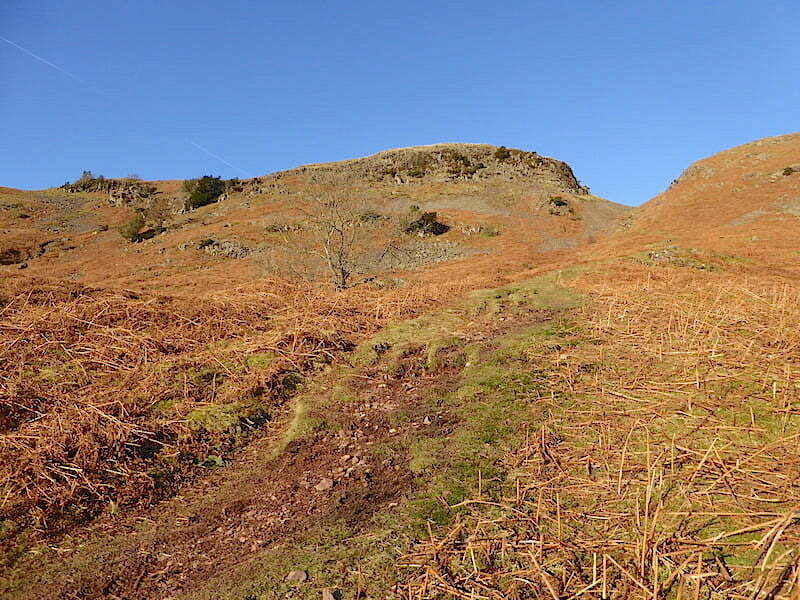 We briefly considered continuing on over to Blea Rigg and returning via Easedale but rapidly abandoned that idea. 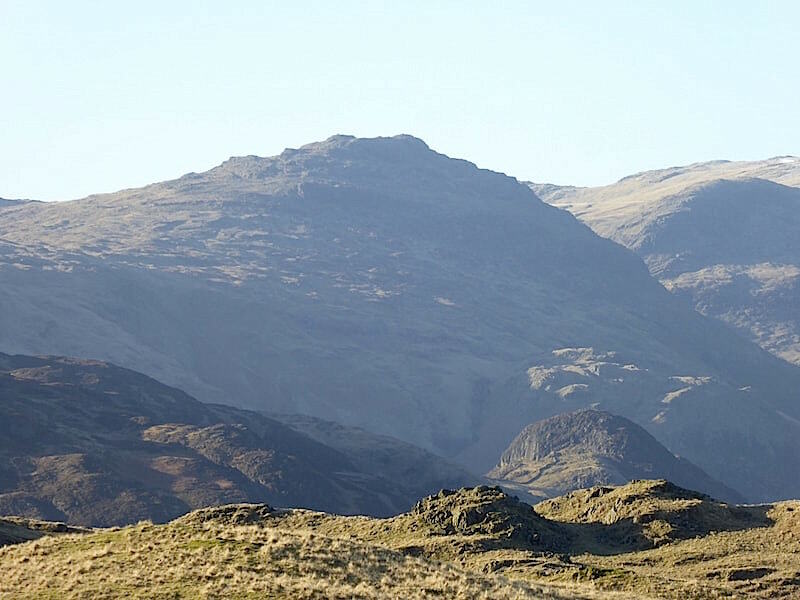 The thought of walking over the ridge with a painful back, the strong and bitter wind battering us every which way, and then returning along Easedale in deep and frosty shade somehow held no attraction whatsoever. 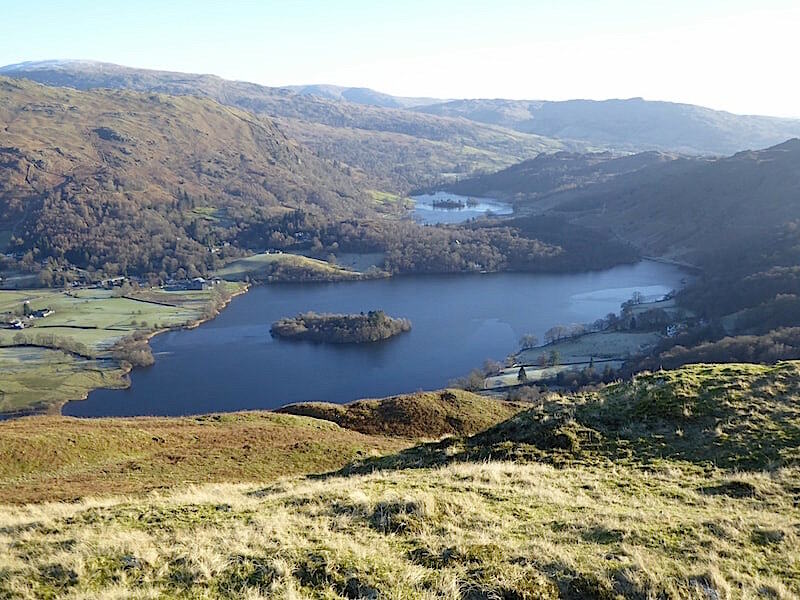 Let’s just enjoy another view of Grasmere and Rydal Water …..
….. and another look over Grasmere and the eastern fells before we go back down. No, I haven’t burst into tears, the wind was just eye wateringly cold and I’m looking into bright sunshine into the bargain, the shutter clicked just as I was wiping my streaming eyes. We had another go at it …..
….. so I tug the peak of the hood down to shade my eyes and cup my hands on either side of my face to stop the wind getting at the tear ducts again, by which time the photographer’s hands are totally numb, he’s grizzling and considering putting in a formal complaint to the management. I felt duty bound to point out that it is an occupational hazard for any photographer in winter conditions and furthermore this was the only time today his gloves have been off his hands. Mine on the other hand ….. well you can imagine how the rest of it went. Heaven help me if he gets ‘man flu’ next week, I’ll never hear the end of it! 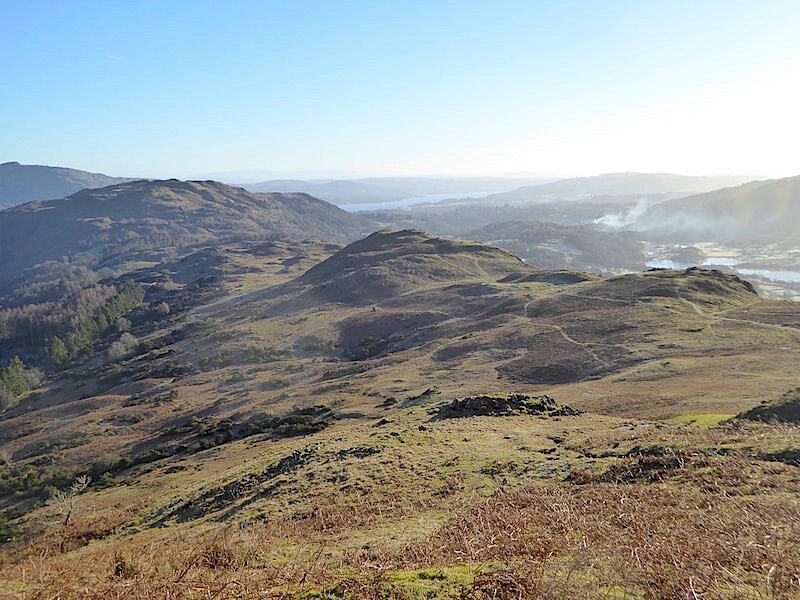 A look back at the summit of Silver How as we drop down towards the Dow Bank path …..
….. and a look ahead towards Loughrigg with Elterwater to the right of it and Windermere beyond it. 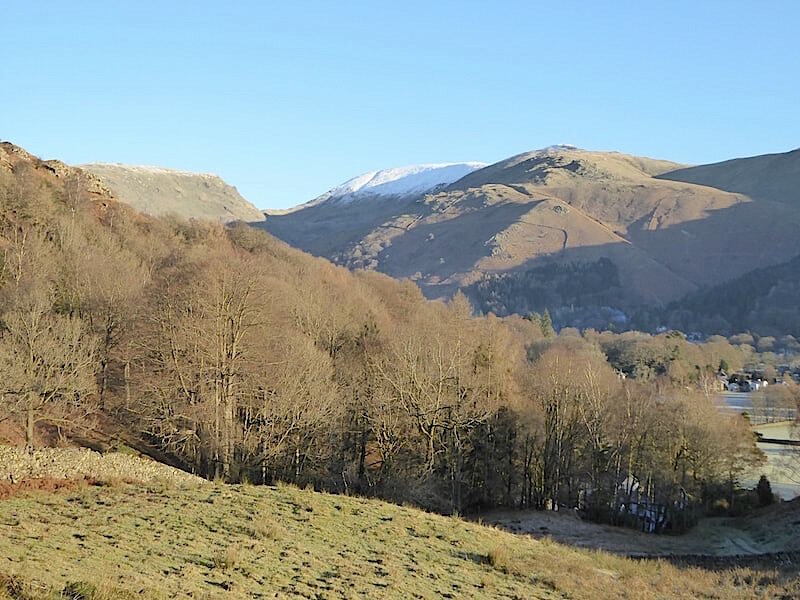 Looking along the Vale of Grasmere as we make our way back along the slopes below Silver How, the summit of which is over on the left. I did try but there was nothing I could do about hiding my shadow. Back just below the point where we branched off earlier to climb up to the summit of Silver How. 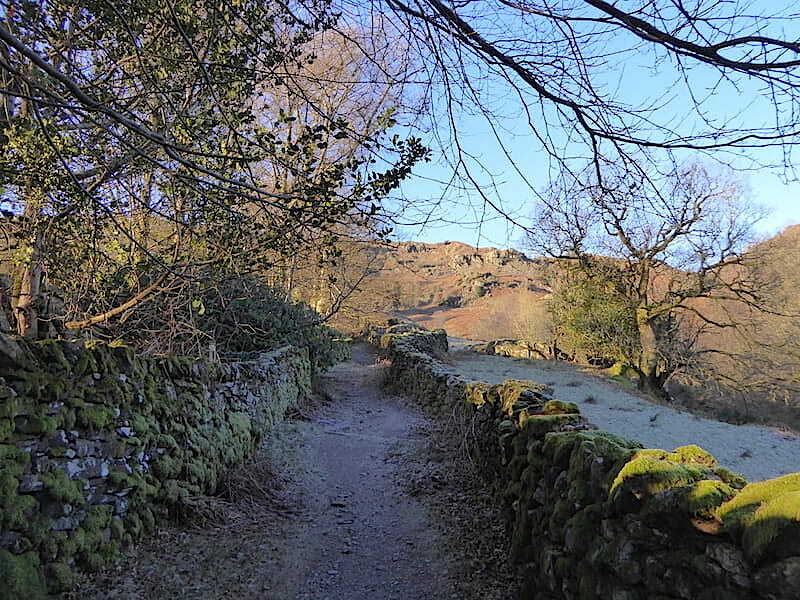 The path we’ll follow is right behind me, alongside the wall, as we head down it towards The Wyke. 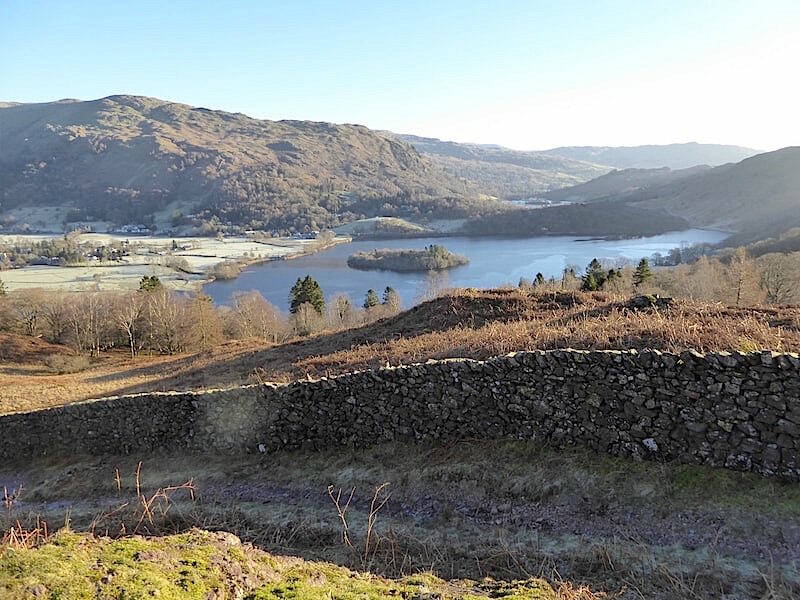 As we descended through the woods we thought that, as it was still only half past twelve, we could carry on and extend our walk alongside Grasmere, and maybe even Rydal Water. That meant that the return path to Wyke would take us a little closer to the village than we wanted to be so, a little further along, we took an off path route down to the Red Bank Road. 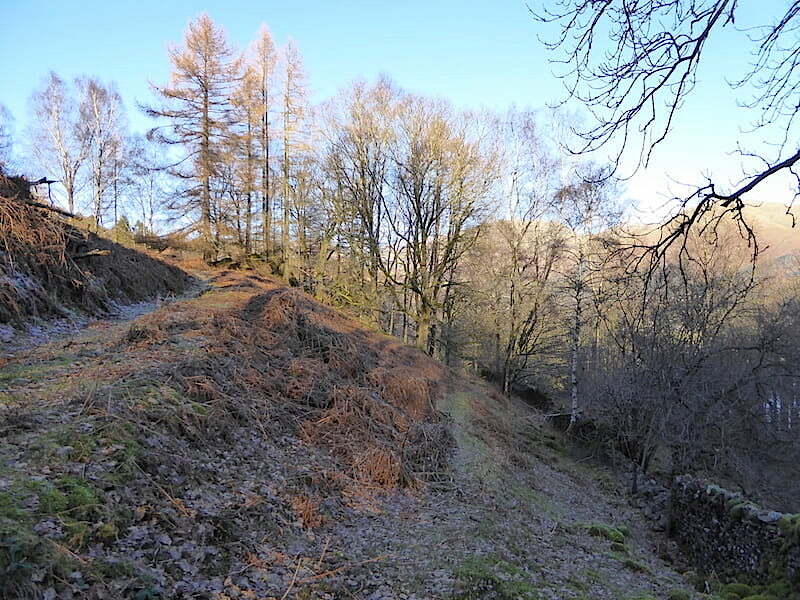 Its not something I would recommend though, it was good enough today because everything underfoot was frozen solid but it would be a very messy route, full of leaf litter and dead branches, on softer ground. We walked up Red Bank Road and then took the public footpath which leads down to the water and the walk alongside it. 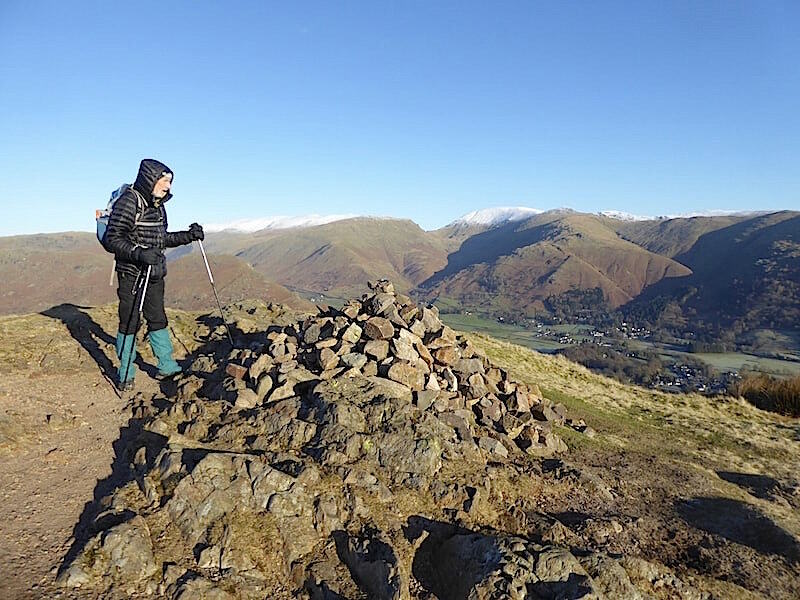 We had a short stop here because by now my back was letting me know that if I could see my way clear to getting it back somewhere warm and comfortable it would be more than grateful. Perhaps it did all it was capable of during yesterday’s outing and although I haven’t pushed it too much this morning its definitely not happy. Its not yet one o’clock but already this side of the water is in deep shade all the way along its length because the fellsides behind us are now blocking the sun. 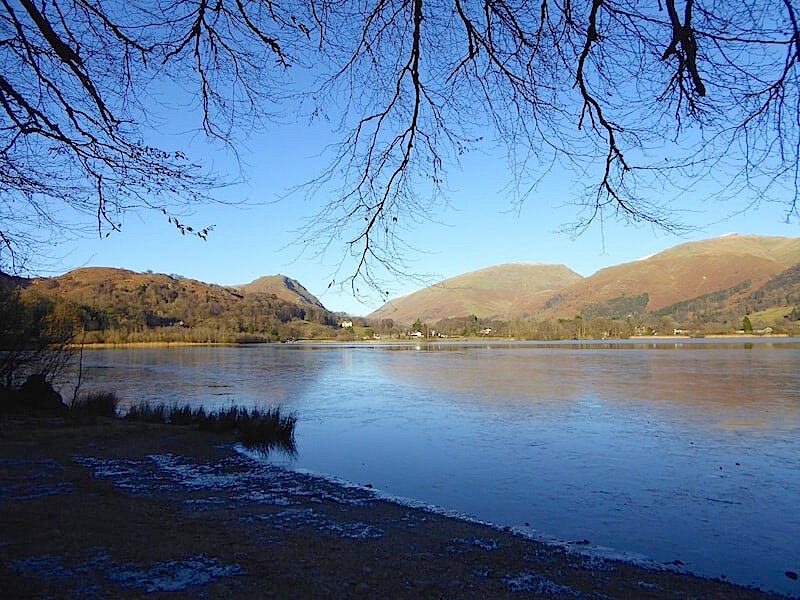 Hobbling on along a shady and chilly lakeside path lost its earlier appeal for me so we decided to return to Grasmere back along Red Bank Road. 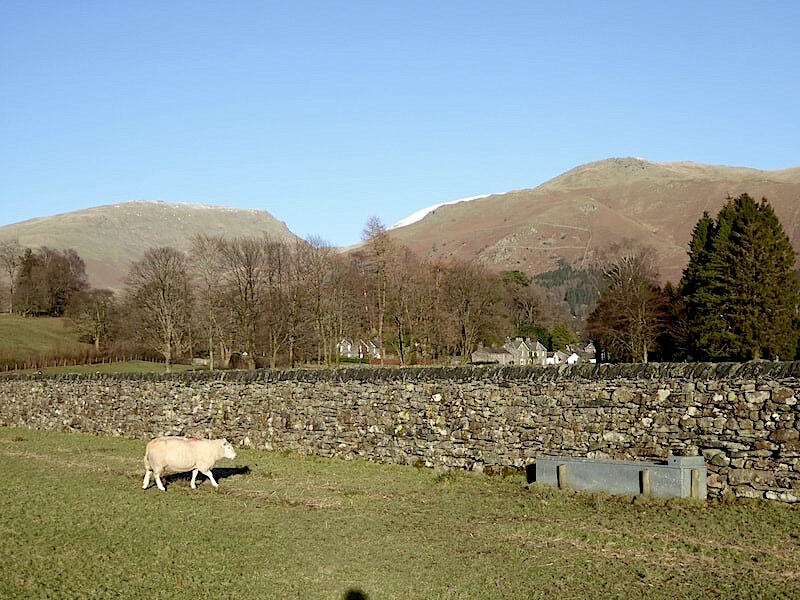 Back in Grasmere and a sheep walks purposefully towards the water trough for a drink. As only one tiny corner of the surface wasn’t frozen it had a bit of a struggle until J went over and broke the ice so it could get at the water more easily. We walked/hobbled back through the village and took the riverside path back to the A591 and the car. By now the hot water bottle had gone cold and the car seats were chilly to the derriere. I had never given much thought to heated car seats up to now, but as I sank into the cold comfort of my seat I was wishing that a swift click on a dashboard button would result in a warm, soothing glow wrapping itself around me all the way home. If nothing else it would be a whole lot more comfortable to deal with than a lumpy and wobbly hot water bottle. Roll on Friday when I can look forward to another session of sports injury massage treatment to try and get things back to normal. 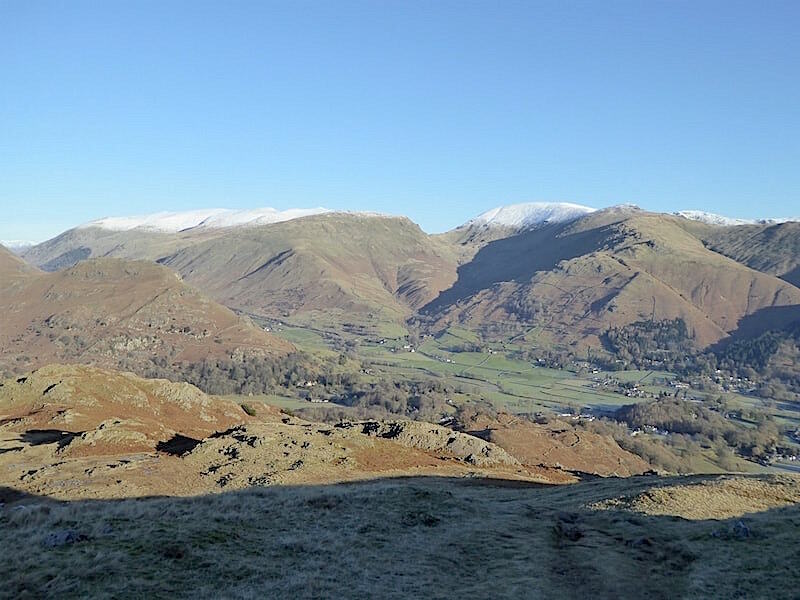 The weather between now and then doesn’t look as if its going to be up to much so we won’t be tempted to go out walking anyway.